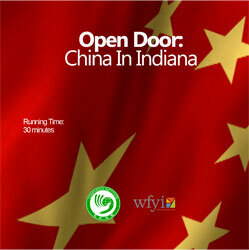 Open Door: China in Indiana reveals how this ancient Asian culture has evolved into a relationship that will be a defining force in Indiana's future. The state's economic experts explain why direct relationships with China are crucial to business here at home. Students from Indiana's premier medical school share clinical hours with their Chinese counterparts. Learn why Mandarin is one of the top language courses now embraced by public schools, and see how Chinese and Hoosiers alike are flocking to classes and camps that teach everything from dance to art to calligraphy.